Remember when, five months ago, a hurricane flooded the New York City subway system, thus washing out tunnels and a few stations? It certainly didn’t take too long for the MTA to get service up and running and implement solutions — from the temporary to the permanent — to restore service. The same has not happened at 181st St. in Washington Heights, and a neighborhood group is raising a stink about it. Money doesn’t seem to be the culprit here. The MTA had vowed to start work a year ago, but each time the due date came around, the project was delayed. Last week, though, Citnalta won a $42 million contract for the work, but no start date has been unveiled. As various maintenance projects move forward, I’m left with the same concern: When the MTA has a fire under its belly lit by politicians and Board members, action happens quickly. When projects are left to languish, they languish with a vengeance. For riders at 181st St., they continue to eye the ceiling warily as repairs slowly inch down the pike. Due to Hurricane Sandy, the MTA’s new Fastrack program suffered a premature end in 2012. The November treatments were canceled as the MTA worked first to restore subway service and then to repair the transit system. Despite this road bump, Fastrack will be back in 2013, and yesterday, New York City Transit unveiled to me the full schedule of work lined up for the coming year. In a press release issued Monday, Transit touted the benefits of Fastrack. 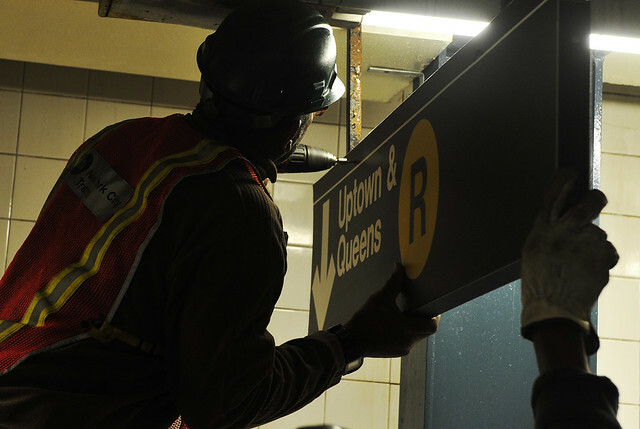 The overnight subway shutdowns allow MTA workers unimpeded access to subway infrastructure, and repairs and renovations can be completed quickly and without the same fear of passing trains. The agency used some glowing phrases to describe “an increase in productivity and significant decreases in employee accidents and maintenance costs” and cited cost savings — to the tune of $17 million — and reduced delays as reasons for a 2013 return. As the 2012 version of Fastrack focused on the system’s core trunk lines in Manhattan and parts of Brooklyn, the new track segments venture further afield into the Bronx, Queens and Upper Manhattan. Still, the MTA assures its customers that these new routes have bend chosen because “there is adequate alternate means of transportation, including enhanced services along some bus lines during work periods.” I’d stick with alternate nearby subway lines over late-night bus service, but that’s just me. So what are these new corridors? They include the Concourse Line (D) north of 161st St., the BMT Broadway Line (N/Q/R) between Queensboro Plaza and Court Street; the Eighth Avenue Line (A) north of 168th St.; the Queens Boulevard Line (E/F/M/R) between 5th Ave./53rd Street and Roosevelt Avenue; and the East Side IRT (4/5/6) north of Grand Central to 125th St. There will be a few one-offs during the year as well. Each Fastrack segment will receive four treatments a year when service is shutdown overnight from 10 p.m. to 5 a.m. for four consecutive nights. First up is the D train’s Concourse Line during the week of January 14. That will repeat during the weeks of April 8, July 15 and November 4. The BMT Broadway line will be shutdown during the weeks of January 28, April 15, June 17 and September 30. The A train won’t venture north of 168th St. during the weeks of February 25, June 10, August 26 and November 18. The Queens Boulevard work will occur during the weeks of March 18, June 3, August 12 and October 14. Finally, the 6 train will be offline during the weeks of March 25 and September 9 while the 4 and 5 tracks will be shut down during the weeks of May 20 and October 28. But! That’s not all. In addition to this trunk line work, there are a few other overnight Fastrack happenings. Out in Brooklyn, between the D train’s Coney Island Creek Bridge and the North Stillwell Interlocking, the MTA will conduct a weekend day-time Fastrack during the weekends of February 2, May 18, September 5 and November 23. Furthermore, a series of one-offs will dot the year. The J train tunnels in Manhattan will undergo maintenance during the week of April 1 while the F train’s Rutgers Tube through to Broadway/Lafayette will be off during the week of December 2. The R train will not run south of 36th St. along 4th Ave. during the week of May 6, and the 2 train will not operate south of Franklin Ave. during the week of January 21. The A/C/D trains will not run from 59th St. to either 168th or 161st St. during the week of September 16. That’s quite the laundry list of Fastrack, and if you’re eyes haven’t glazed over yet, congratulations. The MTA is clearly engaged in an aggressive attempt at, well, something. It’s a money-saving effort to speed up necessary and vital repairs. It’s a major inconvenience to many late-night commuters who have few alternate routes. It is, as I’ve said before, the new normal, and it’s taking over more and more of the system. It starts up again in just a few weeks, and one day soon, we won’t remember when Fastrack wasn’t a part of the normal way of things. We don’t always like it, but we live with it. During the MTA Board and Committee meetings this week, the agency will present a detailed breakdown of its request for capital funds to repair the transit system after Hurricane Sandy swept through. Overall, the MTA is asking for $4.755 billion, nearly all of which the agency expects to receive from the federal government and insurance. The MTA is also asking for permission to bond out $950 million should the need arise, but what’s missing from the document speaks nearly as loudly as what’s in it. That’s not new, and neither is the MTA’s estimated cost projections. We know South Ferry, for instance, is going to cost $600 million to repair, but now we can see why. The new document contains cost breakdowns, and maybe it makes this price tag a bit easier to swallow. It’s now just $600 million for one station that, a few years ago, cost $540 million to build from scratch. Rather, it’s $600 million for a comprehensive repair of a large station complex and nearly all of the technology within. According to the PDF, the South Ferry/Whitehall Station costs combined will add up to $600 million. Of that total, $350 million will go toward station repairs, $20 million will go into line equipment repairs, $200 million will go into signal and communications equipment repair, and $30 million will help repair traction power. It seems clear from this breakdown that the $600 million does not include work inside the Montague St. Tunnel. Although there is no line item for the individual tunnels, the total for other signal work reaches $770 million. No matter how we slice and dice it, it’s still a lot of money, and the bulk of it will go to South Ferry. After all, Whitehall St. is already open and in revenue service. Still, with South Ferry totaled and Whitehall not unscathed, the costs mount. We still need a serious examination of how the MTA spends money and why projects cost so much though before we can be completely satisfied by this price tag. Whether we will get one remains an open question. But as I said, this document is notable for what it doesn’t have as well. It doesn’t have any details about preventative measures. The MTA wants nearly $5 billion to repair and restore its transit network, but it doesn’t yet know how much it needs to protect the system or what those protections will look like. As two MTA officials said to me during my last Problem Solvers event at the Transit Museum, it’s just too early to know what to do. It’s too close in time to the storm and too many resources are devoted to repair and restoration work. For now, that’s OK. It’s important in the short term to bring the transit system back to where it was before the end of October, and for now, the MTA should be spending its limited resources on that approach. But that conversation needs to happen. It should happen this week as the MTA’s Finance Committee and full Board assess the funding request. It should happen as repair work moves forward, and it should happen after repairs are completed. The next storm will come, and it can’t cost $5 billion each time. Mayor Bloomberg — much to the chagrin of Joe Lhota — likes to opine on transit issues when, to put it delicately, the topic isn’t quite his forte. During the immediate aftermath of Hurricane Sandy, the mayor seemed to pull timelines for the restoration of transit services out of thin air. Now, hizzoner has decided to tackle the problem of post-Sandy reconstruction costs. There’s no doubt that, as Bloomberg says, there are a lot of things New York could do with that money. A $5 billion infusion of capital funds would cover a subway station at 41st St. and 10th Ave. on the 7 line extension and the next phase of the Second Ave. Subway. And I know and you know just how badly the subway could use that funding. Yet, Bloomberg seems to be resisting progress here. In two consecutive years, we’ve gotten two storm swith the potential to be the storm that happens once every 110 years. Last year, the city dodged a bullet when the storm essentially passed over us; this year, Sandy’s full force hit us head on. New York’s politicians and the MTA can’t ignore changing weather patterns and the threat rising tides pose to the city’s transportation infrastructure. With an infusion of cash and an opportunity to prevent future catastrophic flooding, the time to act is now. It’s tempting to sit back, as the mayor has done, and note how quickly things returned to almost-normal, but that’s not the right answer. Storm surges and flooding pose major threats to the subway, and even as New York City needs more of a Second Ave. Subway and transit expansion projects, it needs to protect the current system as well. Apologies for the silence on Monday. I was out of town for the weekend and forgot to put up a note on Friday’s post along with the service advisories. I did get to experience the rains and storms along the outer bands of Tropical Storm Isaac. It’s dumping an impressive amount of rain down south. So over the years, as I’ve followed the progress of the MTA’s current (and future) megaprojects, I’ve returned regularly to the issue of cost. It’s no secret that the current subway and rail construction costs in New York City are out of control. The projects are billions of dollars over budget as well as years behind schedule, and that doesn’t even begin to account for the fact that these budgets are bloated to begin with. Here’s a sampling of the problem: On Manhattan’s West Side, we’re getting a one-stop subway extension from 41st St. and 8th Ave. to 34th St. and 11th Ave. (with some tail tracks) for $2.1 billion. The project is set to wrap up a few months late, and we lost a golden opportunity to build a station at 40th St. and 10th Ave. over half a billion dollars. The Second Ave. Subway promises to deliver two miles of subway for nearly $4.5 billion. It is up to four years late depending upon which scoping document you read. East Side Access is an unmitigated cost disaster. Meanwhile, New York’s projects are orders of magnitude more expensive that similar projects throughout the globe. Forgetting China where costs have crept up, New York’s subway construction costs trump any other comparable city’s. So why? That’s the question Stephen Smith tried to tackle in a piece on Bloomberg View last week. It’s worth a full read, but I’ll excerpt. American politicians have different priorities. The Port Authority of New York and New Jersey is spending $3.8 billion on a single subway station at the World Trade Center designed by Santiago Calatrava, a Spanish architect known for his costly projects. If New York could build subways at the prices that Paris and Tokyo pay, $3.8 billion would be enough to build the entire Second Avenue subway, from Harlem to the Financial District. So that, you might be saying, is nothing new. What about the causes? Smith pinpoints a number of culprits. First up is the problem of a conflict of interests. U.S. transit agencies love their consultants, and the consultants can then bid on their own projects. Cross-pollination, in which transit officials move back and forth between the private sector jobs, also leads to inflated budgets and excess spending. Finally, lowest-price bidding systems often lead to project budgets that do not and cannot align with reality or a lack of quality control. Somehow, the new South Ferry station cost $500 million and is already still leaking. No one can be held responsible without timely and costly lawsuits. In times of crisis, the MTA can do it right. The 1 train returned to service far faster than it should have, and the IND 8th Ave. line was up and running after far quicker than otherwise expected following a 2005 signal fire. But the big-ticket items that we need to improve transportation throughout the region are suffering. Bring down the costs, and the system can expand. It’s not an easy path to follow. Early last month, the MTA announced their latest customer feedback initiative. With the promise of free rides for a few lucky participants, the agency launched a customer survey initiative designed to help the MTA better understand their riders’ opinions of existing services and their priorities for improvement. Three to five times per year, the MTA will approach those who sign up, and as a carrot for completion, some participants will receive a free pass good for 10 rides somewhere. The few public responses to the survey announcement show the never-ending litany of suggestions and complaints. An article in The Poughkeepsie Journal highlighted practical and mundane areas of improvement. These suggestions ranged from doing away with a controversial $10 refund processing fee to better identifying Metro-North’s quiet cars to making sure fare vending machines aren’t reflecting the sun. Suburban commuters, it seems, have less to complain about on a day to day level than subway riders. Within the five boroughs, complaints are endless. Gripes about delays are less indicative of systematic failures than they are of the daily ebb and flow of subway commuters. The louder complaints though concern the infrastructure. As pulsating LED lights have debuted at Bleecker St., riders from outside the core of the system are less than thrilled with station upgrades that seemingly never arrive. One SAS reader complained of conditions at 191st Street, and I’ve heard similar complaints regarding the stations at 168th and 181st Sts. that are literally falling apart. Chambers St. on the BMT Nassau St. line sits underneath the building that houses much of the New York City bureaucracy, and it too is in shambles. Venturing outside of Manhattan, we find recent coverage of conditions along the Sea Beach line. From the photos, you would never know some of these station elements date only from the 1980s as stairwells are eroding, and retaining walls at risk of giving out. Station conditions are grim, and it may be still be anywhere from two to six years until the MTA gets around to fixing up these stops. Subchatters are concerned with the structural integrity of the trench walls, and politicians are calling for emergency repairs. All of which is to say that the list for improvements is endless, and then the cycle starts all over again. Even if the MTA can rehab every single station, they’ll eventually have to start over again as stations that were renovated within the past 15 years start to show their age. It’s the wear and tear of the daily commute played up against a backdrop of an agency that doesn’t have enough money to do what it needs to do and isn’t trusted with the dollars it has. So the list will grow. Everyone wants his or her own local station to look the nicest, to be well lit, to have less water damage and fewer falling tiles, and when those renovations come, they cost too much and take too long. Just ask anyone waiting endlessly for the Bleecker St./Broadway-Lafayette transfer to finally open. A little bit of housekeeping, so to speak, as the MTA announced yesterday two project completions. The three-year rehab work along the West End Line wrapped up with a ribbon-cutting on Thursday morning. The centerpiece of this project was a transformation of the Bay Parkway station into a fully ADA-compliant stop with three elevators. It is the 78th ADA “key station” in the system, and the MTA is now just 22 away from their promised goal. In addition to a standard station rehab with lighting, platform edges and new staircases, Bay Parkway now features a system of free-standing pedestal speakers that provide riders with real-time information. These are i place as the station’s canopies do not extend the length of the platform. The other six stations — 71st Street, 79th Street, 18th Avenue, 20th Avenue, 25th Avenue and Bay 50th Street — underwent component-based repair efforts, and the 33,000 riders who use these stations will no longer have to battle delays and construction. Overall, the $88 million projected funded through 2009 stimulus dollars brought station elements and the elevated structure south of 62nd Street into a state of good repair. That elevated structure, of course, was made famous in The French Connection. 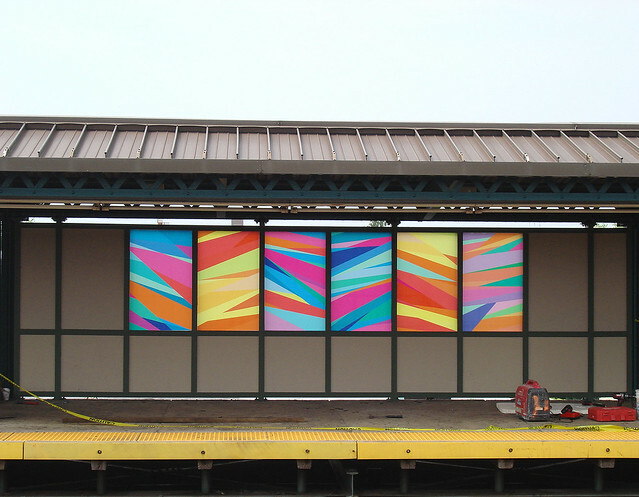 The rehab also features new station art developed by Arts for Transit. The MTA’s official Flickr feed had an album of the new art. I’m partial to the Kaleidoscope at 20th Avenue. Meanwhile, at 7 a.m. yesterday, Transit re-opened the connection at Fulton St. between the A/C mezzanine and the southbound J/Z platform. The little-used transfer had been closed since March 5. With the re-opening of this transfer — although not the completion of work on this contract — the entire A/C mezzanine is now open, and the reconfigured platform access brings the total set of stairs available for straphangers to 10. The Fulton St. Transit Center is still on pace for a June 2014 completion date. Earlier this week, the MTA made, in the annals of capital construction, a relatively major announcement. On Monday morning at around 7:30 a.m., the final East Side Access TBM came to a stop six feet beneath the LIRR Main Line in Long Island City. The TBM named “Molina” made two runs and will now be scrapped. With its end, for the first time in three years, the MTA has no active tunneling machine boring through the city. As part of the announcement, MTA officials were celebratory in their statements. And why not? After all, through economic turmoil, delayed schedules and numerous changes at the CEO position, the MTA has managed to complete 16 TBM runs since SELI, the first of the East Side Access TBMs began mining back in September of 2009. As the tunnels dug out future train routes, New Yorkers and New Jerseyites will reap the benefits of the rock. Some college dormitory foundations have been constructed with the muck; a golf course has been stabilized; and much of the popular Brooklyn Bridge Park sits atop a foundation of dirt that once was under Manhattan or Queens. 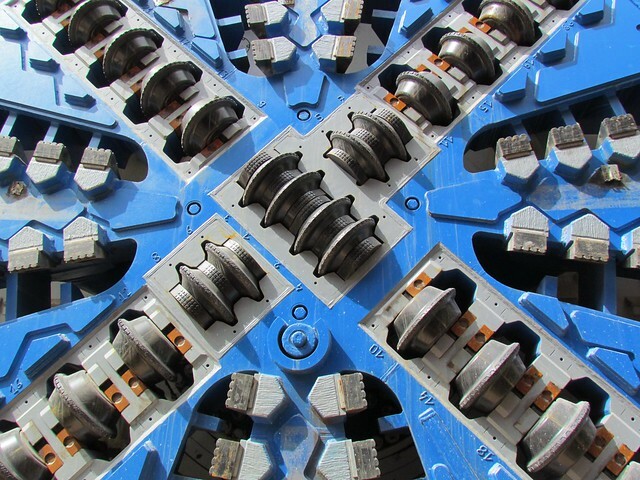 The TBMs though won’t be put to further use in New York City. In its release, the MTA detailed the future of these machines. Adi, the Second Ave. Subway borer, is off to Indianapolis for future work while the two 7 line machines named for Mayor Bloomberg’s daughters have been dismantled. Of the four ESA TBMs, two are being scrapped, one has been dismantled and removed and the fourth has been encased in concrete and buried under Park Ave. at 37th St., a dead end for any sort of southern progress. It is, of course, great news that the MTA has finished mining. 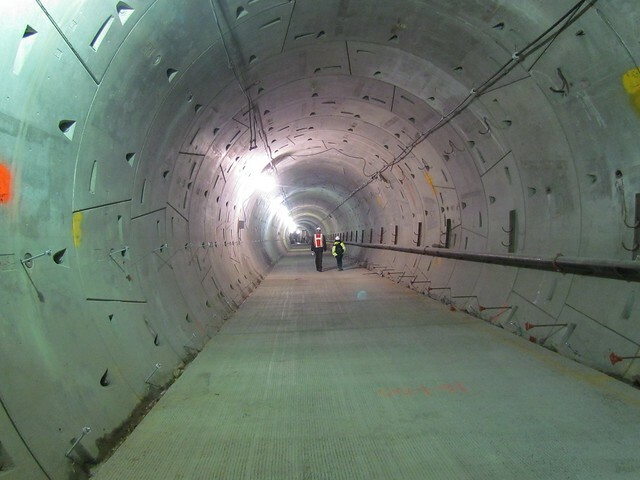 Despite the years of work that still remain, with the tunnels in place, these projects are that more likely to move forward. No politician is too keen on seeing billions of dollars flushed down the drain as preexisting tunnels sit idle and unfinished. So the 7 line will open in less than two years with SAS due to wrap up in 2016 and ESA before the decade is out. It’s a generational change in the transit landscape. Still, the MTA, with proper support, funding and foresight, could have done more. Adi, in particular, represents a lost opportunity as the MTA had a TBM underneath Second Ave. and removed it before the machine could dig south of 63rd St. or north of 99th. Subsequent phases of the Second Ave. Subway will be more complicated and costly due to the need to build a new launch box and procure and assemble another TBM. It’s redundant spending at its worst. Yet, we have 13 miles of new tunnel, and that’s an accomplishment. Soon — or at least soon in the lifespan of a great city — we’ll have new train service and more transit options. It’s hard to be too upset by that news. A little over three years ago, the new South Ferry terminal had an inauspicious beginning. Due to some engineering errors, the gap between the train and the platform edge was unacceptably wide, and Transit had to delay the station’s grand opening for months over a matter of inches. This hold-up was a harbinger of things to come. Over the past few years, we’ve heard of water damage impacting the station and poor water-proofing on behalf of the MTA’s contractors. This week, The Tribeca Tribune checked in on the station, and what it found at the $530 million, supposedly state-of-the-art facility was not promising. Opened to great fanfare in 2009, the South Ferry Station cost the MTA $530 million to build, and the agency continues to give special attention to its daily upkeep. On any given day, a half-dozen workers armed with spray bottles and brooms keep the platform and trains pristine. But careful cleaning by MTA crews cannot hide the fact that the subway’s newest station is already showing signs of damage. Brown sludge drips from the ceiling, congealing in large swaths along otherwise sparkling white walls. In one of the hallways, strips of paint hang where the ceiling has bubbled. Many columns along the platform are missing chunks of tile, and wall tiles along an escalator are cracked or missing altogether. What most commuters don’t know is that ever since the station opened, the MTA has been trying to fix the leaks that are causing most of South Ferry’s problems. “Addressing the leaks has been an ongoing effort,” MTA spokesman Kevin Ortiz said in an email to the Trib. Meanwhile, the MTA and its independent engineering consultant have butted heads over the cause. Jerry Gold, the consultant, said the leaks were a result of shoddy tunneling work discovered before the station opened. By injecting grout behind the walls, this so-called remedial measure simply moved water elsewhere. With money from Schiavone Construction — the contrator who constructed South Ferry and is currently working on Fulton St. — the authority conducted repairs last year, but temporary measures have not been successful. “We’ve done grouting and we need to look at other methods for a more permanent solution,” Ortiz said. With missing tiles and water damage prevalent, the photos attached to The Tribune’s story are well worth the click-through. The story, though, gives me pause. The MTA is currently building four new subway stations in Manhattan and an overly expensive transit center at Fulton St. Should we expect better construction for our millions and billions or are we doomed to a system forever plagued by the ugliness and decay of water damage?